to make the historic patterns. Thanks to all who made the workshop possible. We are looking forward to having Pat Thomas teach a Marbling Workshop on Friday evening through Sunday, March 16-18, 2018. In our workshop, we will learn to float paint on thickened water, manipulate colors into traditional and contemporary patterns with simple tools, and print our own original marbled papers. Participants will progress through historic designs and branch out into the myriad number of adaptations possible. Techniques learned in this workshop can be adapted to fabric and three dimensional objects. The workshop fee for members will be $150. As an incentive to register early, pay before February 1 for a 10% discount ($135). The fee for non-members will be $170, which includes the Guild membership fee (before February 1, $155). 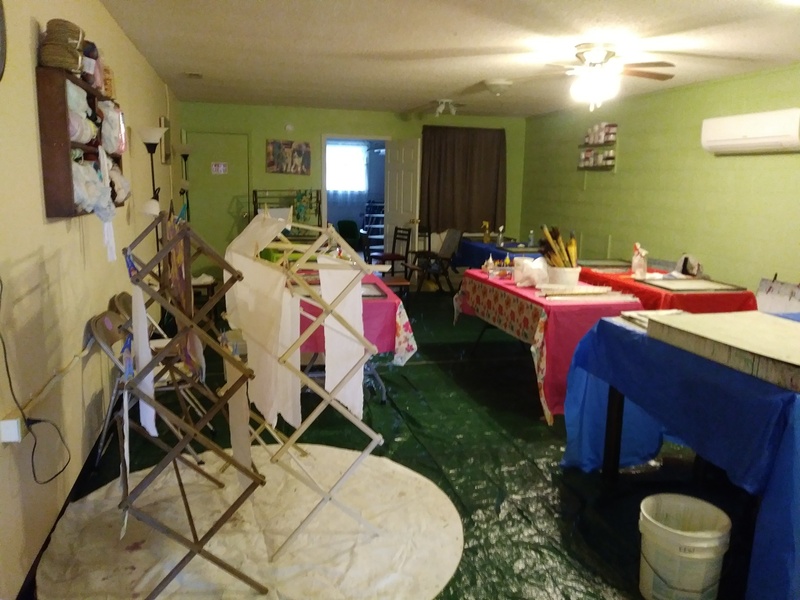 Pat Thomas is a surface design, marbling, paper and fabric artist who is also co-owner of the historic Cliff Dwellers Gallery in Gatlingburg, Tennessee. Pat conducts workshops and classes at locations including Arrowmont and John C. Campbell Folk School. Her work is represented and collected internationally. See examples of her work at www.Facebook.com/SeenMyMarbles. Update: Over 120 people attended Roc Day. Thanks to all who supplied door prizes and organized the event. Thanks to all who came to show what a fiber guild is about. The Huntsville Fiber Guild wishes everyone Happy Holidays. Thanks to all our members, guests, and sponsors for your attendance and support of this years activities. We look forward to another great year in 2018. The weave a towel workshop was wonderful. We had a great time meeting new crafty people, seeing old friends, talking crafts and of course weaving. We indoctrinated 4 new weavers into the craft. 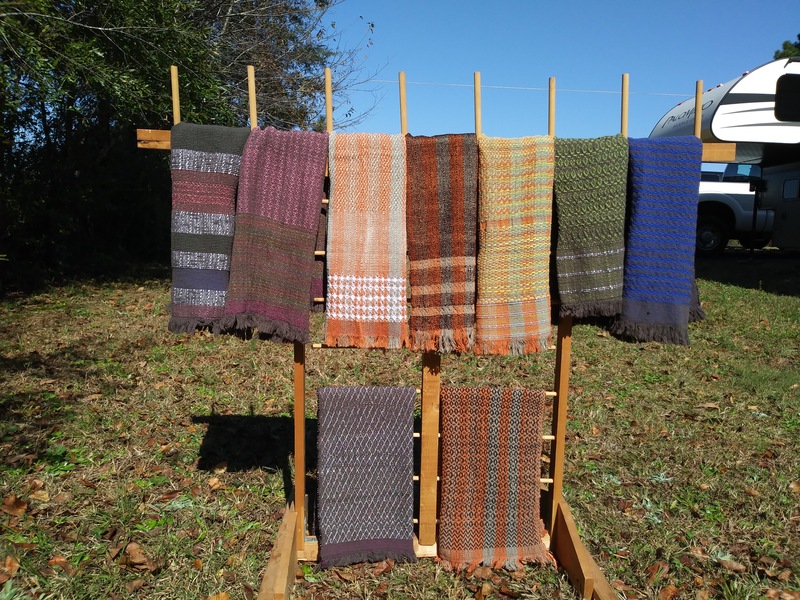 Join us at the Fiber Study Group on December 12 to see the finished towels from the workshop. When: Tuesday November 14 and 28, 6:00 p.m. Attend one session or more, your choice. Where: Member’s home in Toney, contact the guild for driving directions. When: Saturday December 2, 9:00 a.m. – 4:00 p.m.
Supply fee: $15 for first towel, due at pre-registration; $5 for each additional towel, due at workshop. We will weave towels on the looms we prepared earlier. No experience is required. You do not have to attend Part 1 – Dress a Loom for a Towel in order to attend thisworkshop. Please Pre-register by November 18 to reserve a loom or to reserve a space for your loom at the workshop. You will be welcome if you do not pre-register, but you might have to wait for equipment. Bring a chair. 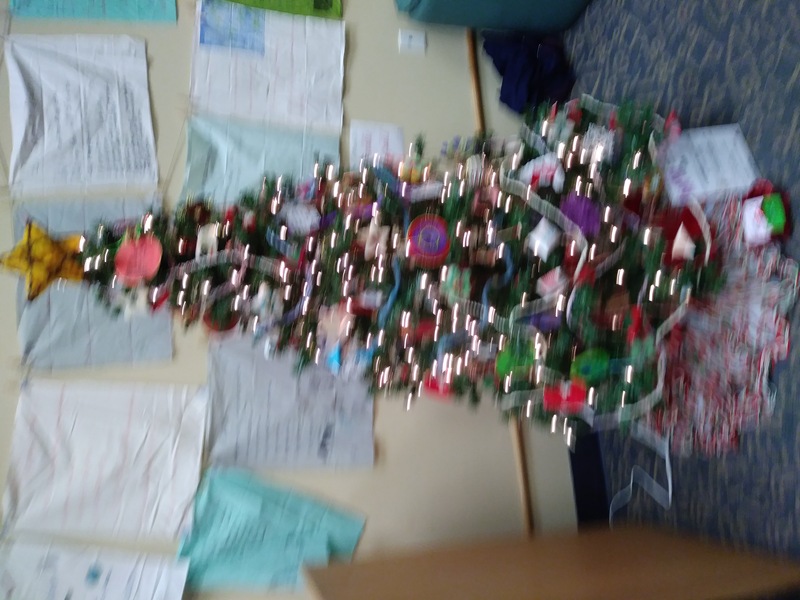 During the month of December, the Main Library (915 Monroe Street SW Huntsville) has the annual Festival of Trees. 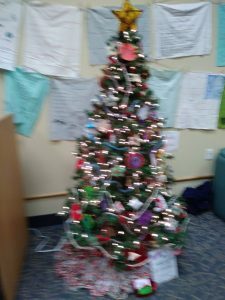 We decorated our annual Christmas tree and selected the theme of “Fiber Critters” for our 2018 tree ornaments. We will have sheep, rabbits, llamas, alpacas and silk worms on the tree next year but we need help. Exercise your creativity in designing these ornaments. Each month, we will share instructions for making a fiber critter so you can work on them as throughout the year. 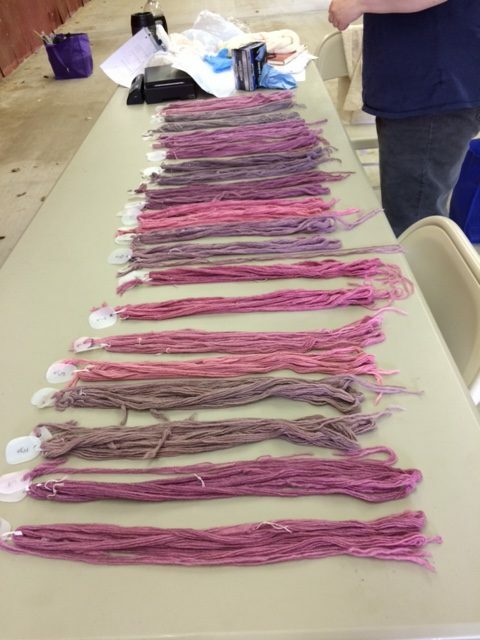 Update: We had the opportunity to make eight different shades/tints from the cochineal and learned that cochineal on unmordanted wool does produce great colors. When: Sunday July 23, 1:00 p.m. – 6:00 p.m.
Where: Private residence in Toney, Alabama. Cochineal is a small scale insect used for dyeing that produces a crimson color which has been highly sought after for thousands of years. The bug lives on the prickly pear cactus found in Mexico and along the Mexican American border. The female is the producer of the red dye. Cochineal can dye various colors depending on the quality of the produce. Please bring in washed un-mordanted wool or wool mordanted with alum and cream of tartar. There will be a pot of mordant available at the workshop. Mordanting and how to prepare the dye pot will be explained during the workshop. To receive information on washing your fiber before the workshop, contact the guild. Ammonia and vinegar will be provided to change color after the dye bath. Bring one skein or up to one pound of wool for dyeing. Be considerate of others wanting to dye. Silk dyes beautifully, but cotton, linen, bamboo, ramie, etc. do not dye. Dyeing is messy, so bring an apron and wear old clothes. Bring plastic bags to take home wet fiber. Please pre-register for location information and directions by contacting the Huntsville Fiber Guild by July 21. You’ll be welcome if you don’t pre-register, but there might not be enough supplies. Card/Tablet weaving workshop update: Attendees enjoyed learning a new weaving technique and were amazed at the variety of patterns that can be woven with cards. Learn an inexpensive and portable method of weaving that goes back to the Egyptians, card or tablet weaving. Begin to learn the language of weaving. 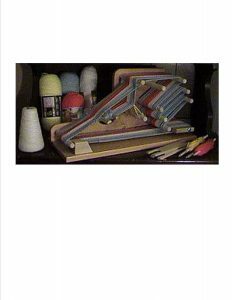 Instead of a loom, you’ll use cards and something to hold the warp threads under tension. Learn how to read card weaving patterns, thread the cards and how to turn them to weave. 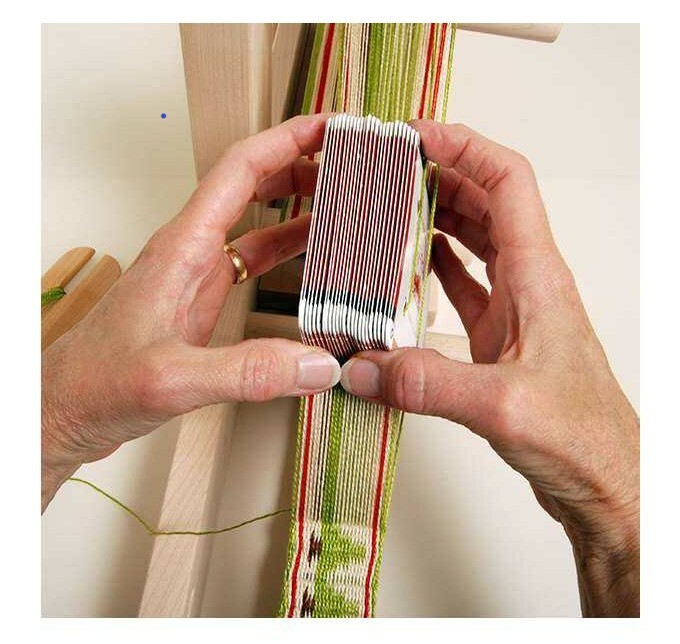 Card weaving produces a warp-faced fabric that is related to braiding. Join us Tuesday June 27, 6:45 p.m. at the Cooper House across the street from the Central Presbyterian Church (406 Randolph Ave, Huntsville). Free use of weaving supplies during the class, $10 if you keep the cards and shuttle, payable at workshop. Pre-register by June 23 by email to HsvFiber @gmail.com. Handouts will be sent by email. Workshop open to adults and youth ages 14 and up. If you have them, bring two C-clamps (at least 2-3”) to use a table top. To make your work more portable, bring two C-clamps and a board at least 2’ long. The leader will provide all the supplies and equipment for use in the workshop. No weaving experience is necessary. Inkle Loom Weaving workshop update: The workshop went well as the attendees wove a guitar strap size band and learned to warp the inkle loom and weave letters. The attendees asked for additional training in card/tablet weaving so that class is being scheduled for June 27. Join us then and learn a new weaving technique. a bookmark, hatband or small pouch to hold a cell phone, MP3 player or coins. The instructor will prepare the inkle looms before class and bring all the tools and supplies you’ll need to use during the workshop. You’ll also learn how to prepare an inkle loom for weaving. No weaving or sewing experience is required. For those who have already woven on an inkle loom, learn pick-up to weave letters to add a message to your band. Pre-register by May 17 to reserve an inkle loom, and to receive the workshop handout by email. You’ll be welcome to the workshop if you don’t pre-register, but there may not be an inkle loom for you to use. The instructor will bring all the supplies for use in the workshop. Just bring a sack lunch and an eagerness to learn.